We’ve taken the essential components of home theater performance and put them together in one stunningly impressive, affordable package designed to do one thing: deliver uncompromising sound quality to provide a world of entertainment you’ve never experienced before. With 100 Watts (6 ohms 1 kHz 0.7 % 1ch Driven) or 60 Watts (8 ohms 40 Hz – 20 kHz 0.2 % Stereo FTC) per channel of clear audio reproduction and advanced new technologies such as 4K Ultra-High Definition Pass-Through and an energy-saving ECO Mode, the VSX-324-K-P is the perfect entry-level receiver to introduce Pioneer’s heritage of quality sound reproduction and innovative technology in your home entertainment system. Continuing to lead the way in Apple® connectivity, the VSX-324-K-P's front USB input now supports music playback and control for iPhone and iPod. The VSX-324-K-P effortlessly brings all your entertainment sources together. Plug in a thumb drive into the front panel USB port and play back all your favorite music files, like MP3, WMA and AAC files. 4K x 2K resolution, usually referred to as simply “4K Ultra HD”, is the latest high definition video display format, with four times the resolution of 1080p. The Pioneer VSX-324-K-P is ready to pass through 4K Ultra HD video signals to a compatible display, meaning it can support home theater systems dedicated to producing the highest quality picture available today. The new, energy-saving ECO Mode found on all 2013 Pioneer AV receivers goes far beyond the conventional wisdom about "green" electronics, with a standby power consumption of only 0.1 watt when enabled. Our ECO Mode offers all of the convenience features of today’s modern AV receivers, including Network Standby and HDMI CEC support, while reducing power consumption in both on and standby modes, you can feel better about your entertainment experience without sacrificing power or features. The VSX-324-K-P supports the latest high-definition audio formats like Dolby® TrueHD® and DTS-HD® Master Audio to give your Blu-ray Disc soundtracks unsurpassed audio quality. Pioneer also includes all Dolby and DTS surround formats best suited for the wide variety of available entertainment sources. Notice the sound not the speakers with this compact 5.1 surround sound system. These small front and satellite speakers are perfect if you want to be surrounded by sound and not even notice the speakers. Their unique contoured design set them apart from the run of the mill boxy speaker. 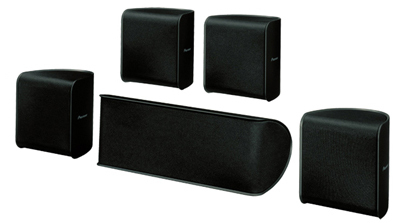 These small speakers can be placed on the top of furniture or mounted on the wall (mounting brackets are supplied for the 4 satellite speakers). The compact subwoofer delivers floor shaking sound effects. Combined with the included VSX-324-K-P receivers and compact speakers, this component home theater system will be the perfect addition to your home.